Johan Small and Prof Madeleine Stiglingh, Head of the Department of Taxation. 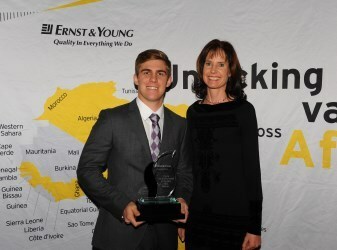 Johan Small, a master’s degree student in taxation, represented South Africa at the Ernst & Young Young Tax Professional of the Year competition and was placed second overall. The competition took place in Copenhagen from 26 to 28 August 2013. Johan earned this privilege after winning the local competition earlier this year, when he competed against young tax professionals from all of the country’s universities. In total, 28 countries were represented at the international competition and he competed against contestants that completed their studies at some of the world’s top universities. After a gruelling first round at the international competition, Johan was selected as one of the six finalists and was eventually placed second. This is a remarkable achievement in its own right. What makes it even more remarkable is that Johan was one of the youngest contestants, and he achieved the second position with no practical experience in international tax, compared to the other contestants. Johan’s only tax exposure up to date is his training at the University of Pretoria where he did a year of academic articles in the Department of Taxation. He is currently in his second year of the master’s degree in taxation and is completing his articles in the auditing division of Deloitte. This achievement not only speaks to Johan’s abilities to solve problems under pressure, but is also evidence of the high quality and practical relevancy of the tax training that students receive through studies at the University of Pretoria.